This metadatabase shall provide an overview of existing vegetation data worldwide, allow researchers to retrieve suitable data to prepare specific research, and thus enhance the awareness and application of this valuable but underestimated source of biodiversity information. Pronouncing the acronym GIVD is intended to remind of the "gift" that database hosts offer to the scientific community by facilitating the use of their data by other scientists. In GIVD, you find metadata about major vegetation-plot databases of the world. This will help you to retrieve suitable data sources for the analyses you plan and to get into contact with their hosts. You can get an overview of and search within the registered databases here. Already 278 databases with 3,411,290 vegetation plots are registered. Registering your own database will greatly increase the visibility of your database and help to attract users of your data and thus potential cooperation partners for you. Uploading your data will cost you approximately 1/2 hour of well-invested time. 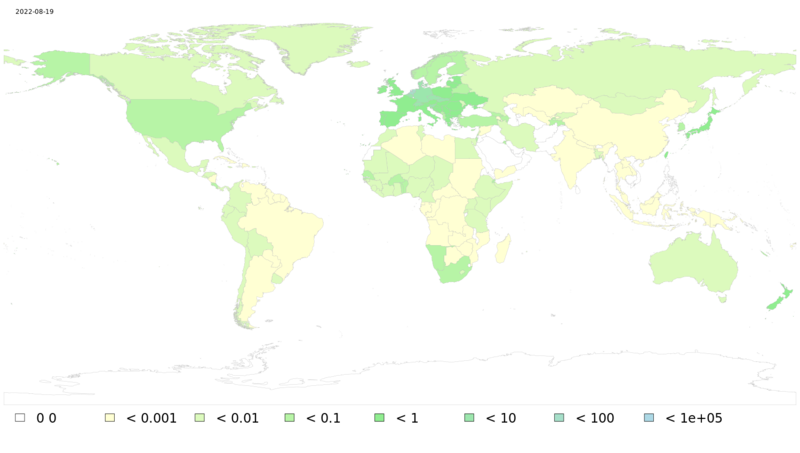 The geographic distribution of registered vegetation plots depends on complete announcement of (1) Number of independent plots (2) Percentage of plots for every mentioned "Covered country". If you find your country underestimated please check these fields in your database entry. Color classes are number of vegetation plots per country divided by the country area in km².